Indiana goes back on the road on Thursday evening for a meeting with Nebraska, which is 9-1 in Pinnacle Bank Arena. It will be the first trip for the Hoosiers to the new venue, which opened last August. After evening up its home record in Big Ten play, Indiana will have a chance to do the same thing with its road record in league play on Thursday in Lincoln. It’ll be no easy task, as Nebraska is 2-1 at home in the Big Ten at home with wins over Ohio State and Minnesota and a one-point loss to Michigan in early January. And while going into Nebraska and getting a win the past two years hasn’t been difficult — the Huskers were 7-11 at home over their first two Big Ten seasons — things are different this year. The addition of second-year coach Tim Miles, who is bringing much needed enthusiasm to the program, along with the new building that is attracting sellouts, makes Nebraska a program that seems to be on the rise. In a conference with 10 of 12 teams that already have three or more losses in league play, this upcoming three game stretch (at Nebraska, Michigan, at Minnesota) is critical as Indiana closes in on the halfway point of league play. A couple of wins could put the Hoosiers in line for a finish in the top half of the league. Two or three losses, on the other hand, could make seven league wins the ceiling. Such is life in 2014 in the Big Ten, which is once again the nation’s toughest league. If you’re going to make a list of the best Big Ten players you’ve never heard of, go ahead and put Cornhuskers wing Terran Petteway at the top. The 6-foot-6 sophomore, who transferred from Texas Tech, is averaging 19.7 points per game in league play and according to Synergy Sports, is the best pick-and-roll player in the league with 1.24 points per possession. 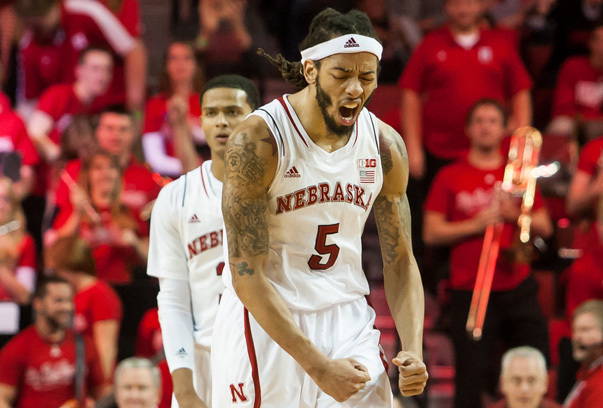 Petteway is coming off his best performance of his career, a 35-point torching of Minnesota. Petteway is using 29.7 of Nebraska’s possessions and is shooting 83.6 percent from the foul line, 48.5 percent on 2s and 39.2 percent on 3s. Nebraska’s backcourt depth took a hit this week when Miles announced the dismissal of backup point guard Deverell Biggs, who was second on the team in scoring in league games at 10.8 points per game. Senior Ray Gallegos and freshman Tai Webster start alongside Petteway in the backcourt and both players bring a little something different. Gallegos has taken a team-high 94 attempts from behind the 3-point line, where he’s hitting 37.2 percent. Webster, a freshman and native of New Zealand, does a solid job getting to the line (73.6 free throw rate), but is turnover prone (26 percent) and a work in progress. Sophomore point guard Benny Parker figures to be the biggest beneficiary from the Biggs dismissal, as he’ll slide into the role of backup for Gallegos and Webster. Nebraska’s frontcourt isn’t spectacular, but it’s very solid. Shavon Shields, who has some guard skills, plays the role of undersized four and is averaging 11 points and 5.9 rebounds per game. Shields is a decent 3-point shooter (35.5 percent), but is most dangerous as a slasher who can get to the foul line (60.9 free throw rate). Walter Pitchford, who transferred from Florida and was a one-time recruiting target of Indiana, starts at the five and can step out and shoot it. Pitchford is hitting 37.9 percent from distance and is only turning it over on 3.4 percent of his possessions. Pitchford’s back up is 6-foot-8, 255-pound wide body Leslee Smith, who is easily Nebraska’s best rebounder (13.8 OR%, 21.6 DR%). Smith also makes the most of the offensive opportunities he receives as he’s hitting close to 60 percent of his shots. The major factor in this game for Indiana may come down to how well the Hoosiers are able to get to the foul line. Nebraska fouls quite a bit, doesn’t defend 2s very well (52.4 percent in Big Ten games) and is also last in conference play in blocking shots (6.9 block percentage in Big Ten). Simply put, Indiana has to get to the rim and either finish shots or get to the foul line. The turnover battle also looms large as both teams have been turnover prone (21.2 percent for IU vs. 19.4 percent for Nebraska), and in a game that has a chance to be played with some pace, avoiding the sloppy turnovers that have plagued IU in many of its losses will be critical. One area where IU may struggle to find success is the offensive glass as Nebraska is the Big Ten’s best defensive rebounding team. Opponents are rebounding just 22.9 percent of their misses against the Cornhuskers and given that IU’s lowest offensive rebounding percentage in Big Ten play to-date has been 27.3, it’ll be interesting to see if the Hoosiers can find any traction there. The Pomeroy prediction likes Nebraska to win, 72-69, and gives the Hoosiers just a 38 percent chance to leave Lincoln with a victory. Sagarin likes Nebraska by 1.5. Given how good Nebraska has been at home and the energy its crowd is bringing in the first year of Pinnacle Bank Arena, Indiana must bring the energy it had early in East Lansing as opposed to the sluggish start it had in State College, a game the Hoosiers needed a valiant comeback effort to win. Nebraska is hot at home, with consecutive wins over Ohio State and Minnesota, but the Hoosiers certainly have a difficult matchup for the Huskers to handle with Noah Vonleh and also have a chance to create problems by getting into the lane and to the basket. Looking at the remaining road schedule, this is, statistically, the third-most winnable game remaining behind Northwestern and Purdue and one that will go a long way if IU is to make a push at .500 or better in league play. This is why Neb was a good addition to the league.In there third year they have began to build a basketball program that can compete and sell seats.Something PenState hasn’t done in twenty years. After a crazy Wednesday night in the Big Ten, a win over Nebraska (a tough task but it is doable) would put Indiana in a tie for 4th place in the conference. Penn State winning in Columbus, Northwestern winning in Madison…wow. We used our 2-3 zone surprisingly well against Illinois. Was that a fluke or have we figured out something (that something being sliding Yogi down to the baseline/wing of that zone and keeping two longer players up top) there? When we are in man-to-man, I would expect Yogi to take Webster, Robinson to take Petteway and Sheehey to take Gallegos. Then Williams gets Shields and Vonleh gets Pitchford. I would think we’d switch everything on picks because the Cornhuskers are pretty good at pick and roll and pick and pop sets. Nebraska is a surprisingly decent rebounding team while I think we have been a mostly elite rebounding team for the majority of games. We are going to have win rebounding to have a chance. As the article points out, getting to the rim and either getting fouled or actually finishing at the rim (please, we are very due for this!) will be critical and should be a big part of the game plan. This is a very important game. A loss would hurt, a win would be huge…go get ’em Hoosiers. I like your analysis. Part of getting into the lane or at the rim is getting Neb to go to the bench and then hoping our bench is better than theirs. Tim Miles kinda reminds me of CTC in many respects. Yes but basketball didnt have much to do with these teams being added to the league. Its all about the$$ those football programs bring. On a side note if I am a college coach at a major program ( hope you are listening CTC) and Penn St. lets go of Chambers I am adding him to my staff in a heart beat. The guy is a great coach at a university that cares nothing about bb.He would compliment CTC very well IMO. I usually cringe when we go zone but we looked pretty decent against Illinois as you said. Like everything else, its seems like the guys are finally starting to “get it”. I have hated our zone for the most part as well but against Illinois it was very effective. As far as this team finally starting to “get it”….I don’t know. We will look great against Wisconsin but then Wisconsin turns out to not be that great (still thrilled with that win, nothing can change that). Then we look awful against NW and drop that one at home but NW is making most of their opponents look pretty ugly. Then we almost win in East Lansing and then beat Illinois but Illinois is not good and that game was a bit too close for comfort. I think this team is improving but it’s still really hard to tell what to expect from this group on a nightly basis…if nothing else, they will keep it interesting! TV time. When you’re not a top 25 team, you don’t tend to get “prime time” game times that will be on TV. Hasn’t he been pretty good lately? It’s amazing to me how tough the entire B1G is. There are no easy games. The advanced metrics give Indiana just a 38% chance to beat freaking Nebraska! NEBRASKA! That’s crazy. I was at the NW upset of Wisconsin last night. Man, I don’t know what sorcery Bo Ryan uses on these refs but it is downright ridiculous. At one point the fouls were 22-5. Free throws 22-2. NW kicked theirs butts but the refs would not let it happen. Meanwhile, down 15 UW decides to press (they are not, by any means a pressing team, ever) and I have never seen a team break down like that at the D1 level in my life. NW looked like 4th graders. They were literally passing UW the ball for layups. They ran the same terrible press break over and over and turned it over 6 times in 3 minutes!!!! Collins looked like an idiot. Their PG never touched the ball. Dear Coach Crean, when we go to NW, PRESS!!! Press until we puke! We will win! Good win for NW but man it was a debacle in the end. My dog cowering in the corner while I scream and gesticulate at the television because we can’t finish at the rim. But our defense keeps it close. Michigan and Michigan State games are CBS weekend games, which are always in the afternoon. Not to open an old wound..but given the doldrums IU’s offense was in during the N-W game in B-town..I couldn’t understand why IU didn’t at least try the press then. Just to shake things up..no other offensive adjustments had been forthcoming. But let me tell you something..that NW defense is the best I’ve see at shutting down drives in or near the lane.I f you can’t kick it out and hit 3’s..u are in trouble as IU and WIS have proven. That press darn near cost NW the victory..I mean they melted down for a while…WIS just couldn’t make the shots to catch up. Believe it or not WE are an average team, just above average at best. The truth is hard to swallow but we will get better as the season goes on but so will everyone else. We can beat the best team in the BIG and lose to the worse in the BIG. That’s just reality. Doesn’t matter who we play its going to be a battle every game from now on. Its all about being consistent which we have struggled with to get victories. My feeling on the zone is simple, when they miss open shots it works. Illinois was awful from the outside. Neb is coming off its best three point shooting game ever. The zone might cause major issues tonight. I said the same thing last night. My wife asked me if I was going to call CTC and tell him. For once, I will be extremely upset with him if the press is not used. 40 mins!!! The greatest coach ever cant teach his players to set up on a crawford ball screen!! Seriously Bo!! This will come down to our guys playing like men tonight. This team is rough and tough. You must finish thru contact and box out. Don’t settle for three’s and step out on the screens. This team in my mind is better than illinois, purdue, PSU and NW. Winning this will be a huge step in righting the ship towards march. Lose, not unexpected. Alex pointed out we would need 5-1 vs the bottom three. This was always the game I expected to lose. Not nw at home. Great chance to make up for it. Prediction now, WE WILL WIN SUNDAY VS MICHIGAN. LOCK IT UP AND PARLAY WITH SEATTLE ON THE MONEY LINE!! Based on the way we shot in that game, I’m convinced our best way to score is to press 40 minutes. I’d say the same about Miles but I don’t think he’s going anywhere (unless it’s up to a bigger and better program,) any time soon. Seems like a good guy and a damn good coach. Undersized 4. This may be the best chance for a return to prominence for Jeremy Hollowell. I’d also like to see the press, but I wonder why no one does it the way Wooden used to with the forwards as the main guys. Sheehey and Williams seem physically like that’s what they’re bred to do. Yeah, but which team will have the issues – IU, or Nebraska? Sunday won’t make much difference if IU loses tonight. Winning Tonight Is A Bonus To Winning Sunday. Now, ole Slick here loves seeing the badgers lose as much as the next Hoosier, but every time they lose a little piece of IU loses too. Need for those wins to look good at the end of the year! Let’s play full court press and drive the lane and own the boards and and and make FT. Sounds about right to me. I’m not a fan of it myself – leaves too many open opportunities, especially from outside. Stan was 4 for 5 with 10 points in first half. Why didn’t he get another shot until 2 minutes to go????? I can’t speak for your dog’s experience, but the rest isn’t far off. I would ask him – he’s generally in the business of creating his own shots. It’s a fair question and despicable of Crean. It’s a loss squarely on the shoulders of coach. Gotta be in the game to create your own shot. Tim Miles figures out what his team was doing wrong at halftime. He corrects the problem. Nebraska narrows the lead to 6 points. He who likes to smack his hands together rapidly (I won’t use his nickname. I know it disturbs the Crean lovers on this forum) responds by (1) fielding a line up including Colin Hartmann, Hanner Perea, and Jeremy Hollowell and (2) running dementedly up and down the sideline with his hands moving through the air at supersonic speed. The outcome – predictable! Well, except in college ball, as random as it might look, the coach is generally calling a play. One such play is for Stan to take it to the hole (the other players clear out and get in rebounding position). I didn’t see the game, so I am just wondering why Crean did not call Stan’s number in the second half as it appeared Neb had no answer for him in the first half. Perhaps they were doubling Stan’s drives in the second half?? That pretty much puts the nail in the coffin on a tourney bid.